The Boston Blades are a professional women's ice hockey team in the Canadian Women's Hockey League, and are based out of Boston, Massachusetts. The Blades play most of their home games at the New England Sports Center. Since beginning play in the 2010–11 CWHL season, the Boston Blades have won the Clarkson Cup on two occasions; once in the 2012-2013 season, and again in the 2014-2015 season. 2011-12 2nd Did not win necessary amount of playoff games (2) to qualify for Clarkson Cup Championship. 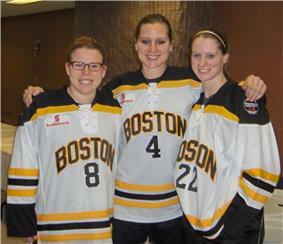 Boston Blades players: #8 Caitlin Cahow, #4 Angela Ruggiero and #22 Kacey Bellamy. On August 12 2010, the CWHL announced that Boston would be granted an expansion team for the 2010–11 CWHL season, ultimately making the Boston franchise the first US team in the CWHL. On September 14 2010, retired goalkeeper Erin Whitten was named Boston's first head coach. An expansion draft was held to stock the team in August. Their most significant player was free agent signing Angela Ruggiero, four-time Olympian and one of the greatest stars of women's hockey history. The Boston Blades’ inaugural season included 16 home games. Their first match, on October 30th 2010, ended with a 3-0 shutout victory over the Burlington Barracudas, and the team began the season with seven victories in their first twelve games. A seven-game losing streak ensued, however, and the Blades finished with a 10-16 record, but still good enough for third place in the five team league. In the playoffs against the Toronto Aeros, the Blades lost 4-2 and 3-1, and were swept in the best-of-three series. In the 2012-2013 season, the Boston Blades became the second American-based team to capture the Clarkson Cup, the women's equivalent of the men's Stanley Cup. The Clarkson Cup is named after Canada's former Governor General, Adrienne Clarkson. The Blades beat rival Montreal for the clinching victory, and were also the regular season champions. Hilary Knight was named CWHL MVP, Geneviève Lacasse Best Goalie, and Digit Murphy Coach of the Year. In the second last game of the regular season in 2013-14, Jessica Koizumi became the first player to register 50 career points with the Blades franchise. In the 2014-2015 season, the Blades finished the regular season with the best record in the CWHL. Their regular season record was 15-2-1-6, good enough for the first seed in the Clarkson Cup Playoffs. In the first round of the Clarkson Cup Playoffs, the Blades were matched up against the fourth seeded Toronto Furies. The best-of-three series ended in a sweep for the Blades, as they collected both 3-0 and 7-3 victories. On March 7th 2015, the Boston Blades matched up against the Montreal Stars in a battle for the Clarkson Cup. The Blades were on a quest for their second Cup in three years; the Blades had previously won the Clarkson Cup in the 2012-2013 season. Both the Blades and Stars tallied goals in the first and third periods. Hillary Knight and Brianna Decker were the lone goal scorers in regulation for the Blades. Regulation ended with the score tied at 2-2, so an overtime was required to decide a winner. Wasting little to no time, Janine Weber scored the series-clinching goal with 2:12 in the overtime period, earning the Boston Blades their second Clarkson Cup. Nine players of United States women's national ice hockey team were rostered on the Boston Blades for 2011-12 CWHL season.